by Lannon, John M.; Gurak, Laura J.
Today’s employees are tasked with writing documents such as emails, memos, letters, and informal reports, as well as more complex forms of communications such as formal reports, proposals, web pages, and presentations. 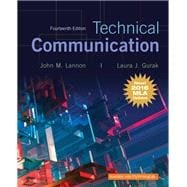 Technical Communication, Fourteenth Edition builds upon the authority of the previous editions by clearly guiding students to write documents persuasively, effectively, and with an eye towards technological innovations and global communications. It incorporates the interpersonal, logical, ethical, and cultural demands of these different forms of workplace communications and provides students with the necessary skills to navigate these nuisances. Building on research and writing skills and touching on the importance of ethics, the authors prepare students for technical writing in any field. John Lannon is Professor Emeritus and former Director of Writing at the University of Massachusetts Dartmouth, where he developed the undergraduate major in professional writing and later co-developed the M.A. program in professional writing. He has also taught at Cape Cod Community College, University of Idaho, Southern Vermont College, and University of Strasbourg. He has authored and coauthored five major textbooks in business communication, rhetoric, and technical communication, book reviews, filmstrips, and environmental documents and instructional software. He is the recipient of an NDEA Fellowship and Fulbright Lectureship. He holds a B.S., M.A. and Ph.D. from the University of Massachusetts Amherst. His initial training and work was in biomedical science and technology with the USAF. He has served as a communications consultant for various companies and government institutions. He worked seven years in medical laboratories. Laura J. Gurak is professor and founding chair of the Department of Writing Studies at the University of Minnesota, where she teaches courses in technical writing and digital communication. She holds an M.S. in technical communication and a Ph.D. in communication and rhetoric from Rensselaer Polytechnic Institute. She is author of two books from Yale University Press, one of which was the first book-length study of online social actions. Gurak is also co-editor of several edited collections and author on numerous conference presentations and papers. She is a recipient of the Society for Technical Communication’s Outstanding Article award. Gurak has authored and coauthored five textbooks in technical communication published by Pearson. She has worked as a software developer, technical writer, and communications consultant for various companies and organizations.